New GPU accerated features have special requirements. You should check your video card specs to be sure that it supports OpenGL 2.0 and is updated with the latest drivers. If you are running XP64, the GPU option will be disabled. 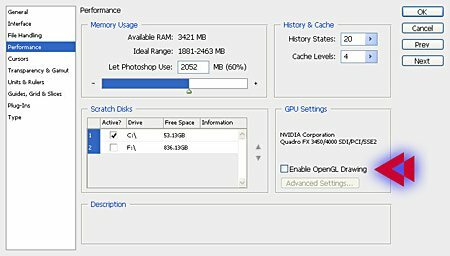 You will need to run this script to allow you to enable the GPU features. You will then need to enable OpenGL Drawing in the Performance setting. Take a look at the screen capture on the right. Only Photoshop CS4 is available in 64-bit. All other programs in the Web and Design Premium Suites are still 32-bit! You may need to disable your Anti-virus program prior to installing. Symnatec Anitvirus stopped the installation on my workstation. I needed to cancel the process, disable Symantec and then start the process over again. You may want to uninstall your older version of Photoshop/Adobe Suite prior to installation and run a registry cleaner just to tidy things up. But I need my plugins … what can I do? For starters, Topaz Labs actually does includes both 32-bit and 64-bit plugins when you purchase Topaz Denoise 3, Adjust 3, Simplify and Clean 2 ! And, yes you can install both sets on the same computer, one for Photoshop 64-bit and one for Photoshop 32-bit! Noiseware also includes both 32-bit and 64-bit plugins and they are even installed at the same time. Photomatix is also available in both 32-bit and 64-bit plugins. Adobe realizes that Photoshop CS4 64-bit is still ahead of the curve. When you install Photoshop (alone or in a Suite), you will have the option to install both the 32-bit and the 64-bit versions on the same computer. You will not be able to run both versions at the same time and there is no way to swap a file between both versions. But, it will allow you to keep all those 32-bit plugins!